DENVER - In the interest of encouraging new works composed expressly for the carillon, The Guild of Carillonneurs in North America is pleased to announce a Composition Competition. Anyone, regardless of age or nationality, may enter this competition. Previous winners of this competition are ineligible for the competition immediately following, but thereafter may enter again as well. A composer may submit more than one work, but only one prize will be awarded to any one individual. The composition must be between four and ten minutes' duration (inclusive). Each composition must have been written (completed) on or later than August 1, 2009. Older pieces will not be considered. Pieces previously adjudicated in this competition are also ineligible. Each composition must be an original composition for carillon (not a transcription or arrangement of another work). Full-scale compositions based on pre-existing melodies (such as hymns) are allowed, provided the melody in question is not under copyright; however, please be advised that the judges will be seeking original compositions rather than mere arrange­ments of tunes. Compositions employing additional instruments, pre-recorded sounds, or additional performers (more than one carillonneur) will not be considered. Furthermore, this work must be one which has never been performed (publicly), published, or awarded a prize in a previous competition. Public performance of any winning composition (on any musical medium) prior to the GCNA congress première will be grounds for disqualification of the entry. Each composition must be playable by one person (no duets) on a carillon of 47 cast bells (Tenor c - d - e - chrom. - c4 with low c# and d# omitted) with a 2-octave pedalboard (c - d - e - chrom. - c2) and traditional mechanical (hand-played) action. Composers are advised, however, that they may wish to write the piece so that it may be played also on European carillons, which generally have no more than 1½ octaves, c - g1 pedal range. Compositions for smaller carillons (minimum 23 bells) are acceptable, but pieces will be judged on their own merits alone. Judges cannot award extra points for writing within the limitations of a smaller instru­ment. Optional notes (written in parentheses) for instruments larger than 47 bells are allowed, provided the piece may be played effectively on a carillon with that 47-bell range. Pieces that require a larger range (with no alternatives provided by the composer) may be disqualified at the discretion of the judges. The composer of each prize-winning composition will be required: (a) To assign to the GCNA all publication rights in the composition; and (b) To warrant to the GCNA that the composition does not violate any existing copyright in whole or in part, and that he has the lawful right to authorize publication of the composition. If the composer has any arrangement with any performing rights organizations, such as ASCAP, BMI, SESAC, SOCAN, and the like, the composer will be required to instruct the affiliated organization not to collect performance fees solely on the basis of this composition (in some cases, this may entail waiving rights to performance royalties). All prize-winning compositions will be published and distributed by the GCNA. Compositions that do not win a prize will remain the sole property of the composer. Judges' copies of the compositions will be destroyed following the competition. As many as two prizes may be awarded, the first prize being USD 800,00 and the second prize USD 400,00. The winning piece(s) will be premièred at a congress of the GCNA. A committee of three judges will evaluate all entries received by (or before) the deadline, scoring each piece for the purpose of competitive judging only. The committee reserves the right not to award either or both of the prizes if, in its opinion, no piece meets the criteria for either or both prizes. The scoring is for judging purposes only and will not be dis­closed to the composers; however, judges' comments may be shared with the composer at the discretion of the committee. The judgment of the committee is final. The judges for the competition will be: Lee Cobb (Clearwater, Florida), Jeff Davis (Berkeley, California), Tin-Shi Tam (Ames, Iowa), Thomas Lee (Philadelphia, Pennsylvania - alternate judge. To assure the most objective judging possible, the identity of the composers will not be revealed to the judges until after the completion of the judging process. To preserve anonymity of the composers, we ask that composers refrain from contacting, directly or indirectly, any of the above people. Usefulness: Is this a piece that people would be interested in playing? Effectiveness on the carillon: Is this piece idiomatic to the carillon? Playability: Can a skilled carillonneur actually perform this piece? Originality: Does this piece add something stylistically new to the carillon repertoire? General Musical Interest: Does this piece sustain musical interest throughout? All submitted compositions must be fully legible, and playable from the submitted score, as the winning compositions will be sent to the performer(s) immediately after the results are announced. Should there be a specialized form of notation for the work, a table or explanation must be submitted with the score. 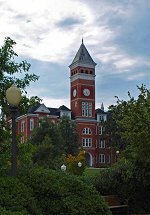 It is assumed that submitted compositions are written with the musical, physical, and technical properties of the carillon and carillon performance in mind. Submit five clear, easy-to-read copies on single-sided pages (good photocopies, no faxes) of your composition. Your name must not appear anywhere on the music. Please list your name, address, and phone number(s) on a note enclosed with the music. On this same note, please state the date the composition was written (completed), verify (state) that it has never been performed and include your signature. Compositions must reach the chairman of the committee, John Gouwens, (who will be acting as coordinator, not as a judge, to assure anonymity of composers) no later than January 15, 2012. The address is: John Gouwens, Att'n Composition Competition, 1300 Academy Road, #133, Culver, Indiana 46511-1291, USA. The results will be established within a few weeks, and composers will be notified shortly thereafter. Should you have any questions, please contact John Gouwens, either by e-mail, by mail at the above address, or at either of the following two phone numbers: +1 574 842 2183 (home) or +1 574 842 8387 (office & voice mail); e-mail address . For further suggestions about composing for the carillon, follow the link . A video demonstration (with accompanying printed notes and examples) is available as a free download at the website location . The demonstration may also be purchased in DVD format. Ordering information will be provided at the website.